I made this salad in association with On1y’s products. If the seasonings I’ve used in the recipe are not available with you then swap them with your choice of spices. 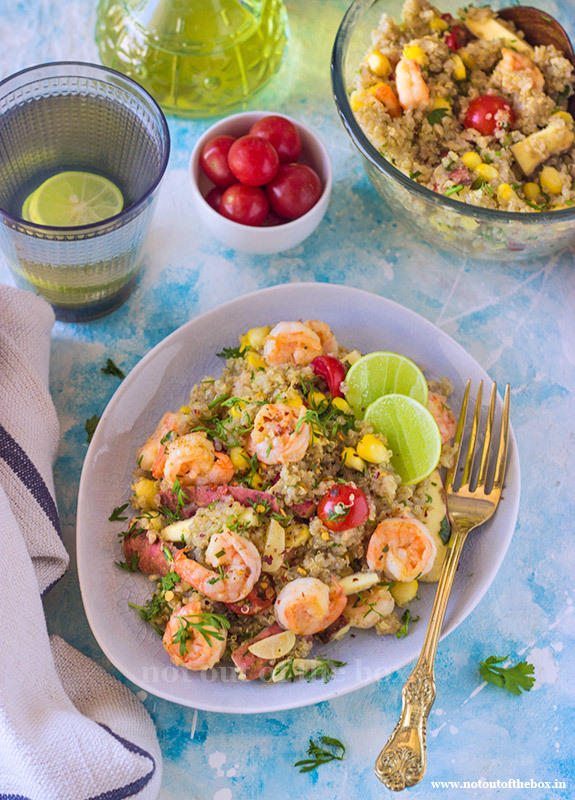 A perfect amalgamation of seafood with healthy quinoa and tossed with some favourite fresh ingredients this Piri Piri Prawns, Sweet Potato, Quinoa Salad is a perfect light meal. Swap it with your usual lunch/dinner or serve it over the weekend. In a bowl mix prawns with lemon juice and salt, keep aside for 30 minutes. Heat olive oil in a frying pan, add sliced garlics and sauté for a few seconds over medium heat. Now add the marinated prawns only, sans the marination. Mix well, and cook for a minute. Add Piri Piri seasoning and lemongrass, mix & cook for 3-4 minutes more. Remove from the heat and keep aside. In a small bowl or jar mix, everything mentioned ‘for salad dressing’, keep aside. In another bowl mix quinoa, sweet corn, cherry tomatoes, sweet potatoes, and cilantro. Now add All-purpose seasoning into this according to your taste. Add cooked prawns and salad dressing, mix well. Check to season and serve immediately.